Sandie of the lovely blog Crumbs of love was our November hostess. 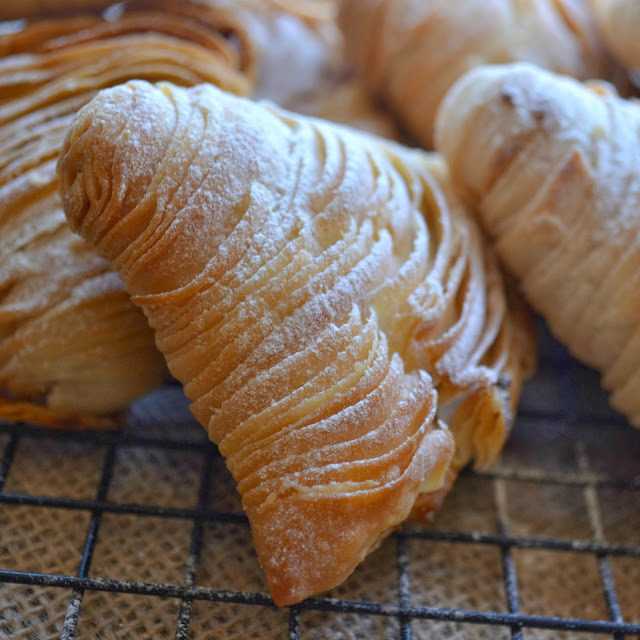 Sandie challenged us to make a traditional Italian dessert along with its American version - Sfogliatelle (or better known in the US - lobster tails). The flaky, 1000 layers of super thin dough, shaped into a horn and filled with a scrumptious filling. Così buono! I opted to make Sfoliatelle Ricci, although Sandie also supplied recipes for Sfogliatelle Frolle and the American Lobster Tails and after I completed the first one, I have every intention of making the other two varieties as well. I dedicate this post to the late co-founder of the Daring Bakers Lisa Cifelli, whom I did not have a privilege to know, but was deeply touched by her early death and the emotional response of the community that she was the centre of for so many years. I did not want to experiment with this recipe too much. Because it's rather complicated technical challenge I was way to concentrated on getting it right first time round and I followed the recipe to the smallest detail. I could have been a little bit more playful with the filling (just added chocolate drops to the original recipe), but I must say that I enormously enjoyed making them and eating them. Please try to make your own Ricotta cheese, it's easy and the difference to the store bought is huge. Begin by lining a large colander or strainer with layer of lightly dampened cheesecloth over a deep dish;set aside. 2. Pour the whole milk, double cream and salt into a large pot and bring to a boil over medium heat, whisking occasionally. Reduce the heat, add the fresh lemon juice and stir for 2-3 minutes. The mixture will curdle, which is exactly what you want it to do. Pour this into the cheesecloth lined strainer and let it drain for about 1 hour or until it comes to room temperature. At this point you can scrape the ricotta from the cheesecloth into a container and refrigerate for up to 2 days. 3. The liquid in the bowl is the whey, a very nutritious and tasty leftover by-product from making cheese. It is excellent to use instead of water when baking bread, or added to soup stock. Combine the milk and the sugar in a medium saucepan. Bring to a boil, then lower the heat and slowly add the semolina whisking quickly to avoid any lumps. Cook, stirring often, until the mixture is smooth and thick, about 2 minutes. Spread the mixture onto a lined baking sheet, about 15 mm, to cool. When cool, break into pieces and place into the bowl of your stand mixer, fitted with the paddle attachment (or a food processor), and add the ricotta cheese, egg yolks, vanilla and cinnamon. Beat until very smooth and creamy. Stir in the candied orange peel and lemon zest. Scrape into a container, place plastic wrap directly onto the surface and refrigerate until needed (up to 3 days). 1. Combine the flour and salt in a large mixing bowl and stir in the water, or use your standing mixer with the paddle attachment. The dough will be very dry. If you feel absolutely compelled, add an extra teaspoon of water but it is supposed to be very dry. Turn this out onto a clean work surface and knead the dough together, bringing in all the dry bits. At this point get your pasta roller out and ready. Roll out the dough to about 1/3 inch (10 mm) and pass through your pasta machine at the widest setting. I find it much easier to cut my dough in half and work 1/2 at a time for this step. Fold the dough in half after each pass also change the direction of the dough occasionally. After about 15 passes the dough should be very smooth. Knead the dough back into a ball and wrap in plastic wrap. Refrigerate and rest the dough for at 2 hours, or overnight. 2. Beat the lard/shortening and butter together in your mixing bowl until very fluffy. Make sure it is thoroughly combined. Place into a bowl and set on the workspace in easy reaching distance. 4. You should end up with a long 4 inch (10 cm) wide strip. Repeat with the other three remaining pieces of dough. 5. *For my own ease of use I made my own rolling pin contraption like you can see on many instructional videos. I turned 2 bowls upside down and placed them on my table where I was planning to work. I then took a rolling pin (with handles, not French) and taped the handles to the bowls. Every time that a piece of dough is finished and ready I lightly floured the dough and rolled it up onto the rolling pin. When all 4 pieces of dough were finished it made it much easier to pull out a section at a time to stretch the dough. If you are clumsy like me you might like to try this too! 6. Place one piece of a strip on you clean work surface and paint (or smear) it liberally with the lard/butter mixture. I do about a 8 inch (20 cm) section at a time. Gently pull the sides of the dough and stretch it, starting from the middle and going out, until it is about 8 or 9 inches (20 or 23 cm) in width. Begin from the short end and start rolling the dough into a very tight roll. When you start to reach the end of your stretched section, stop and liberally grease up another section, stretching and rolling until all the dough is finished. When one strip of dough is finished, overlap the end of one to the beginning of the other; continue to pull, stretch and roll up. 7. Spread the lard/butter mixture over the entire finished log and starting in the middle gently run the hands down the length to extend the length another inch (30 mm) or so. This will release any air pockets and tighten the roll. Your finished roll should be approximately 10 or 11 inches (25 or 28 cm). .
8. Wrap in plastic wrap and chill for at least 2 hours or overnight. The dough may be frozen for up to 3 months, at this time. Defrost it in the refrigerator overnight before using. 10. Line 2 baking sheets with parchment. 11. Remove the dough from the refrigerator, unwrap, and place on a cutting board. Slice off about an inch (30 mm) from each end so that they are straight and even. Cut the roll into 1/2 inch (15 mm) slices. Put the semolina-ricotta mixture into a pastry bag with a 3/4 inch (20 mm) opening (A disposable pastry bag or even a ziploc bag with the corner cut off is fine). 13. Place onto the prepared baking sheet and very lightly brush the outside of each completed pastry with the lard/butter mixture. Bake them in a preheated moderately hot 400°F/200°C/gas mark 6 oven for about 20 to 25 minutes or until they are a deep golden brown. 14. Remove from the oven and cool on a rack. These are best served warm with a sprinkling of confectioners’ sugar on the day they are made. To reheat them, just place them in a moderate 350°F/180°C/gas mark 4 oven for about 5 minutes.